Home » Posts Tagged "Water Reserves"
This infographic reports on some shocking facts about the shameful inequality to clean water access between developing and developed countries and the detrimental consequences for the people, local economies and nations. 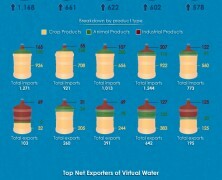 See how the shortage in water reserves for high volume production countries like India, USA and Australia has lead to virtual water trading in an effort to control scarcity and sustain supply. The purpose of this infographic is to address the importance of water reserves conservation and the ignorance people show in water management. The red dots you see on, are active notes with further info that you can see if you follow the publisher link on the left. 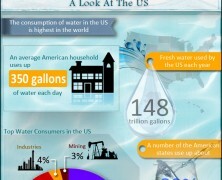 As the global economy grows, so will its thirst! Ban Ki-Moon statement (UN). This report outlines the real picture of current water reserves and future risks due to population explosion and inefficient management. See the real picture and learn what you can do to help.